I had high hopes for The Present. The Sydney Theatre Company production is a take on a lost Anton Chekhov play (Platonov) and stars the unparalleled two-time Academy Award winner Cate Blanchett (making her Broadway debut). 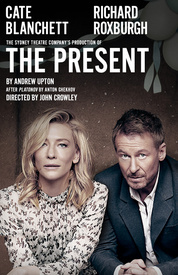 While it was, indeed, a treat to catch Blanchett on stage, The Present is a middling play about a bunch of adults misbehaving. At rise, several old friends and lovers are gathered for Anna's 40th birthday. Anna (Blanchett, Blue Jasmine) was married to The General; his second wife, the couple married when Anna was just 20, and The General died about 10 years prior to the present (set in the 1980s, it seems). 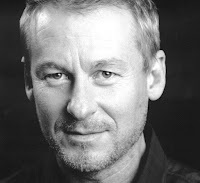 Among the guests are Anna's step-son, Sergei (Chris Ryan), who's only about four years younger than Anna; Nikolai (Toby Schmitz), a life-long friend of Sergei's; and Mikhail (Richard Roxburgh), the boys' tutor and a perpetual flirting partner for Anna. Given the revelers' history, there's a lot of talk of the past. There's also quite a bit of pontificating about the future. Basically there's a lot of talk while they all try to distract themselves from their lives, from the present. (Get it?) Mikhail, for example, is good at telling others what to do but can't take his own advice, while Anna takes a nihilistic approach to confronting the present. There are fireworks, explosions, shots. This is to be expected, of course. The play begins with Anna standing alone on stage, holding a pistol, and we all know Chekhov's maxim about pistols: if a gun appears in act one, it had better go off by act three. The principle here is that everything in the play should be essential. There's no room or excuse for superfluous dialogue and action. The Present doesn't quite live up to that ideal. Like you might expect from a Chekhovian play, The Present, adapted by Andrew Upton, takes its time, building characters rather than plot. (Certain Anna–related character/plot details are reminiscent of The Cherry Orchard leading lady, Ranevskaya.) As directed by John Crowley, there is humor and moments of levity. (There's a particularly titillating mini-Bacchanalia in act two.) Yet The Present doesn't pack the punch other Chekhov plays do. Perhaps it's the melodrama that blunts the impact of whatever Upton meant to impart. Blanchett is terrific, and she has good chemistry with Roxburgh, but this isn't a present that thrills.